"Amazing China," a documentary recording China's achievements over the last five years, has become the country's second highest-grossing documentary ever. 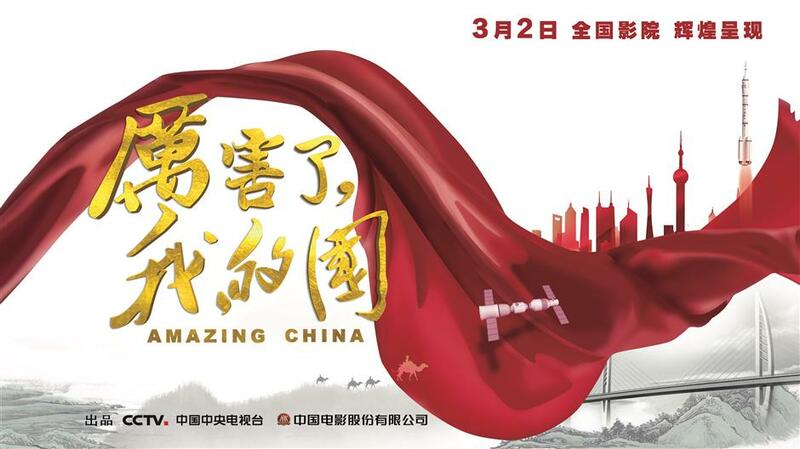 Earning about 125 million yuan (US$19.7 million) in five days, "Amazing China," a documentary recording China's achievements over the last five years, has become the country's second highest-grossing documentary ever. Debuting nationwide last Friday, the 90-minute documentary is expected to win total revenue of 295 million yuan, according to Maoyan, a major Chinese film database. The film introduces a series of major developments the country has made since the 18th National Congress of the Communist Party of China in 2012, including the world's largest radio telescope FAST, the world's largest maritime drilling rig Blue Whale 2, and the development of 5G mobile technology. A poster of "Amazing China," a documentary recording China's achievements over the last five years. The large amount of aerial views of those super projects in this news documentary have brought huge visual impact to audience in front of the big screen, said Rao Shuguang, secretary-general of the China Film Association. "Every scene of the movie is very real and powerful. I am so proud of you, my China," said Zhang Wei, a bank clerk in Shenzhen. "Amazing China" has received over 20,000 reviews in Maoyan, such as "China is amazing," "proud of my motherland" and "I'm so confident of my country" in the comment section. It also records the stories of the ordinary people behind these achievements, such as engineers of infrastructure projects, grassroots officials fighting poverty and businessmen devoted to sustainable development. "Other than just showing what China has achieved, it tells us about the hardworking and perseverant people who made these Chinese miracles happen," said Li Jianwen, a moviegoer in Qingdao. Rao points out that it is the human touch and detailed true stories that have brought the audience closer and won their applause. Scoring 9.6 out of 10 in Maoyan, "Amazing China" is not the only film currently causing patriotic fever across the country. With two weeks into screening, "Operation Red Sea" has raked in nearly 3.1 billion yuan and scored 9.5 points on Maoyan. Directed by Dante Lam, the movie tells the story of the Chinese Navy's elite special forces, Jiaolong Assault Team, as they save Chinese and foreign nationals from war and foil a terrorist plot to obtain nuclear materials to make dirty bombs. It is loosely based on the evacuation of hundreds of Chinese citizens and foreign nationals from Yemen's southern port of Aden during the Yemeni Civil War in 2015. "No overstating, no individualism and no heroism, but it is unexpectedly amazing," said a comment on Douban, another film website. February saw China's box office sales hit a record high of 10.14 billion yuan.